Maximinus Thrax (Latin: Gaius Julius Verus Maximinus Augustus; c. 173 – May 238), also known as Maximinus I, was Roman Emperor from 235 to 238. Maximinus hated the nobility and was ruthless towards those he suspected of plotting against him. He began by eliminating the close advisors of Alexander. His suspicions may have been justified; two plots against Maximinus were foiled. The first was during a campaign across the Rhine, when a group of officers, supported by influential senators, plotted to destroy a bridge across the river, in order to strand Maximinus in hostile territory. They planned to elect senator Magnus emperor, afterwards; but the conspiracy was discovered and the conspirators executed. The second plot involved Mesopotamian archers who were loyal to Alexander. They planned to elevate Quartinus, but their leader Macedo changed sides and murdered Quartinus instead, although this was not enough to save his own life. When the African revolt collapsed, the Senate found itself in great jeopardy. Having shown clear support for the Gordians, they could expect no clemency from Maximinus when he reached Rome. In this predicament, they determined to defy Maximinus and elected two of their number, Pupienus and Balbinus, as co-emperors. When the Roman mob heard that the Senate had selected two men from the patrician class, men whom the ordinary people held in no great regard, they protested, showering the imperial cortège with sticks and stones. A faction in Rome preferred Gordian's grandson (Gordian III), and there was severe street fighting. The co-emperors had no option but to compromise, and, sending for the grandson of the elder Gordian they appointed him Caesar. Maximinus marched on Rome, but Aquileia closed its gates against him. His troops became disaffected during the unexpected siege of the city, during which they suffered from famine and disease. In May 238, soldiers of the II Parthica in his camp assassinated him, his son, and his chief ministers. Their heads were cut off, placed on poles, and carried to Rome by cavalrymen. Pupienus and Balbinus then became undisputed co-emperors. 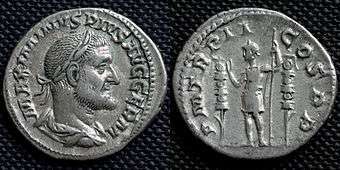 ↑ In Classical Latin, Maximinus' name would be inscribed as GAIVS IVLIVS VERVS MAXIMINVS AVGVSTVS. ↑ Eusebius. "Church History". Book 6, Chapter 28. New Advent. Retrieved 25 April 2014. ↑ Graeme Clark, "Third-Century Christianity", in the Cambridge Ancient History 2nd ed., volume 12: The Crisis of Empire, A.D. 193–337, ed. Alan K. Bowman, Peter Garnsey, and Averil Cameron (New York: Cambridge University Press, 2005), p.623. H. Börm: Die Herrschaft des Kaisers Maximinus Thrax und das Sechskaiserjahr 238. Der Beginn der Reichskrise?, in: Gymnasium 115, 2008. "Caius Julius Verus Maximinus Thrax". Catholic Encyclopedia. 1913. "Maximin". The American Cyclopædia. 1879.